Pomona CA area superior flower shop since 1947. Offers same day hand delivery for any occasion. Products / services are Customized Funeral Arrangements, Tropical Arrangements, Corsages and Boutonnieres, Ballons, Candy & Chocolates, Green Plants, Greeting Cards, Stuffed Animals. Serving Pomona Valley since 1966. 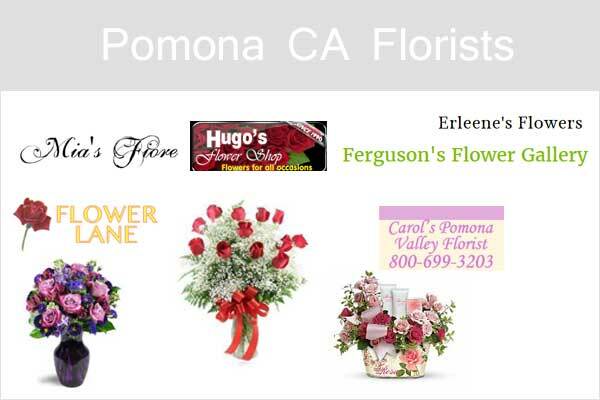 Offers finest floral arrangements and gifts Pomona and surrounding cities including Claremont, Chino Hills, Diamond Bar. Takes orders online and in-store. Same-day delivery on most bouquets. Mon – Fri : 8:30 a.m. to 5:00 p.m. Flower shop in Pomona, CA. Offers Wedding and Quinceaneras, Vase Arrangements, Basket Arrangements, Center Pieces and Funeral Arrangements. Florist in Pomona, California. Flower shop serving Pomona since 2012. Offers any occasion flower arrangements. Erleene’s Flowers can typically deliver the flowers the same day Monday through Friday. Free local delivery is available for local online orders only. One of the best wedding florist in Pomona CA. Provides floral design and gifts for every occasion including wedding, birthday, baby, business etc. Serves Pomona and surrounding areas. Sun & Mon : Closed. Same day flower and gift delivery in Pomona by Mia’s Fiore. Any Occasion Flowers, Birthday Flowers, Anniversary Flowers, New Baby Flowers and Gifts, Love and Romance Flowers, Sympathy Flowers, Wedding Flowers, Corsages etc. Works within your budget for wedding ceremonies.